The DOGO ARGENTINO was visioned by Dr. Antonio Nores Martinez, in 1928, in the province of Cordoba, Argentina. He started with the old fighting dog of cordoba, a dog which was very strong and vigorous but lacked the ability to hunt in a gruop. It is a crossbreed among Mastiff, Bulldog and Bull Terrier. Through methodical crossbreeding of several pure breeds it became not only an excellent big game hunting dog but also very versatile regarding function. It has proved to be a noble companion and a loyal and insurmountable protector of those it loves. Its strength, tenacity, sharp sense of smell and bravery make it the best dog among those used for hunting wild boars, pumas and in my case even small game like pheasants. 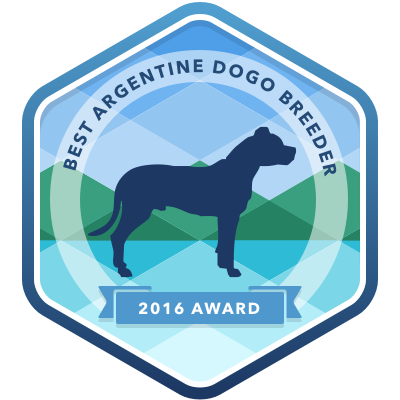 Argentine Dogos have also been successfully used in obedience and agility trials ,therapy ,Schutzhund, French Ring Sport, weight pulling, sled racing, search and rescue and police work, even as seeing eye dogs. Its harmony, balance and its excellent athletic muscles are ideal characteristics for these multiple functions. Dr. Raul Zeballos introduced El Dogo Argentino to the United States in 1970, where it enjoys increasing popularity. By now, this breed has found its way into the hearts of many followers across five continents. On a more personal note, I was captivated by this versatility in function of the Dogo Argentino. I started my journey with Dogo Argentinos in 2008. Through my experience, the Dogo Argentino with the right blood lines as created by Dr Antonio Nores Martinez, proved to be everything it was designed to do. Dogo Argentinos are great family dogs, great companions and great hunters. Any deviation from this blood line and you do not have a Dogo Argentino. he Fighting Dog of Cordoba was the base breed for the Dogo Argentino. The Fighting Dog of Cordoba was a cross breed of English Bulldog, Bull Terrier and Mastiff. The dog was vigorous and strong but lacked the ability to act as a family dog, as well as lacking the ability to hunt in a pack. The Boxer was bred to provide vitality and gentleness. The Pointer provided a keen sense of smell. The Bulldog added boldness, as well as a broad chest. The Bull Terrier made the Dogo Argentino fearless. The Great Pyrenees provided the Dogo Argentino with it’s white coat and protective instincts. The Great Dane provided a large size for the Dogo Argentino. The Irish Wolfhound provided the instinct and ability to hunt wild game. The Dogue De Bordeaux provided powerful jaws. The Mastiff provided endurance, as well as it’s power. Lihuen the end product of all the above still bears resemblance to her ancestor The Old Fighting Dog of Cordoba.